We consider Apple (AAPL) to be a leading dividend growth opportunity (read our article about that), which we hold for both growth and income development. We also sell short-term PUTs on Apple and other stocks at strike prices that we find attractive for additional share accumulation. That generates income on the cash we have in reserve to make those purchases if called upon to do so. If we are assigned we are OK with the price for the additional shares, and if not assigned our cash earns reasonable income. Selling options can be part of an income investing strategy. Our current Apple PUT position is described at the end of this article. Apple is currently suffering a double-whammy of broad market malaise and a bit of post-product release depression. We believe they will recover, and while they are down the current yield and future gain potential is up. Apples’ success has been driven by a series of new product releases, which seem to be coming more frequently. There is, however, some concern about the new releases being more incremental than revolutionary, and that imitators are getting better. We thought it would be interesting to see how the Apple stock price has reacted to product releases over a long period, such as about 30 years. The first thing you run into with long-term charts, particularly of highly successful companies is the difficulty comparing older periods to newer periods in a regular chart, as this Figure 1 chart of Apple from 1983 clearly shows. The product release dates are shown as vertical lines along the timeline. It is more effective to compare old to recent periods with a semi-log price scale as in this Figure 2, so that the same percentage price change in an old period has the same vertical change as a percentage change in a recent period — regardless of price, any given percentage change in price has the same vertical size on the semi-log price scale. The red line is a negative 20% offset from the trailing one-year high, and the tan line is the 200-day exponential moving average. You can see that Apple stock was declining before the release of the MacIntosh in 1984 (“A” on the chart) and didn’t really catch on in terms of stock price until 1985, then went flat until 1990. At that time (“X” on the chart), Microsoft introduced its Windows operating system designed to challenge the Apple user interface. 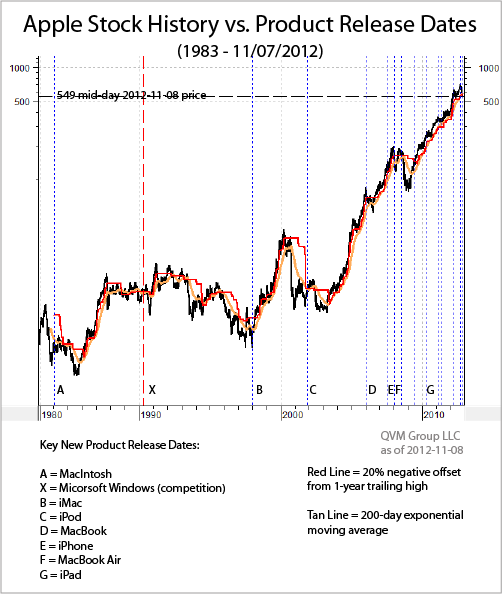 Apple stock then effectively languished with a downward drift until 1998, when it introduced the iMac (“B” on the chart). It took off nicely from there, but got whacked in the dotcom bust. In 2001 (“C” on the chart), Apple introduced the iPod, which decimated demand for the Sony Walkman product , but that was not enough to overcome the gravitational pull of the bear market in stocks. After the 2003 bottom in stocks, Apple climbed very nicely to new highs. 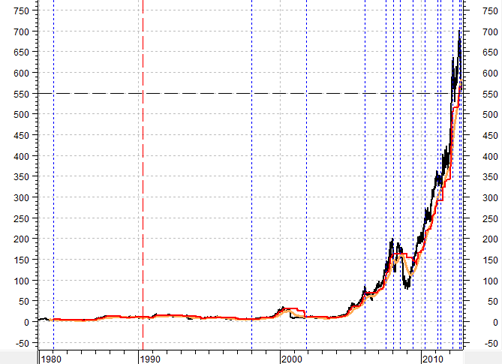 The high before the dotcom bust was about $37. The low after the bust was about $6 (an 84% drop); and the high reached before the next key product release in 2006 was about $86 (about 14 times the low price). In 2006 (“D” on the chart), Apple released the first MacBook. The price subsequently declined about 45% before then approximately rising by factor of 3 to a level more than 45% above the prior high when the MacBook was released. The big news then came in 2007 (“E” on the chart) when the first iPhone came out, revolutionizing smart phones the way the iPod revolutionized mobile music. Apple stock rose about 20% from there over a couple of months, before dropping nearly 25% , and then rising more than 80% from there to a 2007, pre-market crash high. As the stock market was crashing, Apple released the MacBook Air (“F” on the chart), but gravity won that time. The stock took more than a 40% dive, fought its way back to nearly the old high, then collapsed with the market to about $79, more than 60%, before the 2007 high. They had introduced the iPhone2 during the crash but while it made lots of money for the company, the investment community paid no heed and continued to drop the stock price as the world seemed to be coming apart. 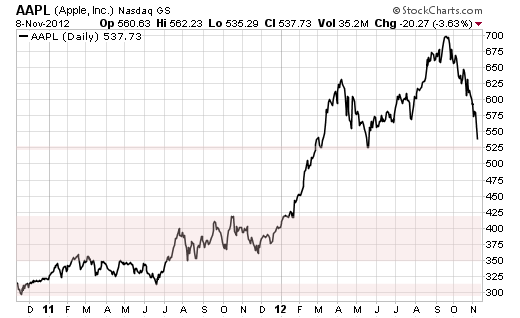 Then in April of 2009 (“G” on the chart), just after the stock market bottom, Apple released the iPad and both the market and Apple stock were off to the races. 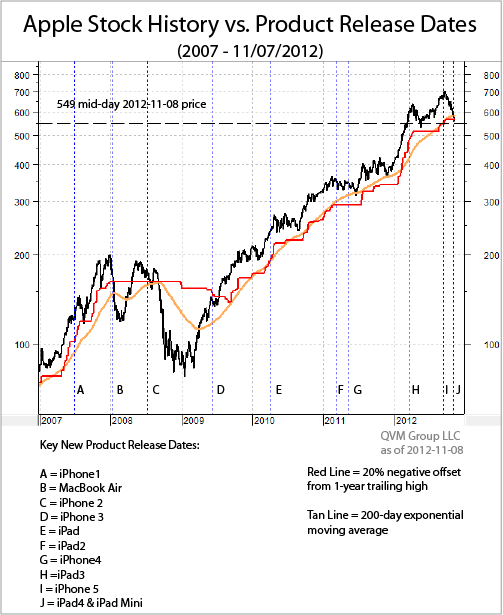 This next Figure 2 presents the Apple chart from 2007 to make a more granular view of version releases of key products. The first iPad release is shown at “E” in Figure 2. The stock didn’t do much for while then rose nicely. All the product releases since then have been version releases of pre-existing products (treating the Mini as a version of the iPad). There have been five device version releases since the iPad came out. Except for the iPhone4, each was preceded by a rise. In each case, including the iPhone4, the release was followed by a price decline. The current decline is more significant than the others. It is below both the 200-day moving average and is below the 20% negative offset indicator. 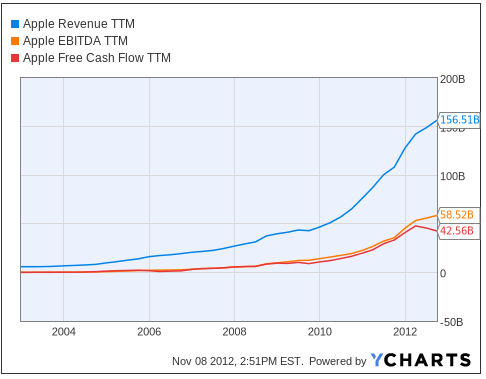 This chart shows that Apple’s revenue and EBITDA are growing well, but not quite as steeply as in 2010 and 2011. Their free cash flow actually declined somewhat this year, as they had to put more into the business to push out all of the new software and hardware. The critical Christmas shopping season is about to open, and that will be telling. There are two important competitors lurking now that were effectively not there before, namely Microsoft and Google. The Surface tablet from Microsoft and the Nexus phone from Google could be spoilers to some degree — we’ll have to see. Both Microsoft and Google are committed now to a vertically integrated “ecosystem” consisting of devices, operating systems, application stores and cloud storage, as is Apple. At the same time, both AT&T and Verizon have stated that they would like to see three “ecosystems” so as not to be beholding to a single source. There are brewing questions about the implications of the top talent changes at Apple, and whether the WOW factor is as great for new versions of existing devices, as it was for them when they were totally new experiences. Apple is a great company with super products, but growth rate maintenance gets harder and harder as company size increases; and it gets harder yet when well funded competitors decide it is a strategic necessity to imitate. Apple and China Mobile (the dominant mobile carrier in China) continue to talk. If Apple can get on board with China Mobile and get a good market share, the next phase for Apple could be amazing. However, the work is harder now and there is not as much broken field running potential as before, either in the US or in China. QVM is long some shares of AAPL and is short Dec ’12 475 PUTs on additional shares. The annualized credit premium on the assignment exposure of the PUTs with 43 days remaining is 8.67%. If assigned, the yield on the new long shares at the current indicated dividend rate of AAPL is 2.23%. The 475 strike price is just below the 10-year linear regression trendline for AAPL (see article on that). We are happy to own more AAPL at 475, and if it doesn’t go there, we are happy to earn 8.67% on our assignment risk. This entry was posted on Thursday, November 8th, 2012 at 4:05 PM and is filed under Analysis, Data, Interesting Charts. You can follow any responses to this entry through the RSS 2.0 feed. Both comments and pings are currently closed.